After a riveting game against the ShEvil Dead in April, the Oakland Outlaws must now face-off against the fearsome Berkeley Resistance! The Resistance arrives this season on the hunt for a return to their status as league champs, but the Outlaws are determined to defend their 2018 title! This bout is sure to be full of big hits, powerful jammers, and nonstop fun for all! Outside food and alcohol are not permitted but there will be food, beverages and alcohol available for purchase. Bars are cash only. There is an ATM on site. Bleachers, floor trackside seating (bring blankets, pillows, support cushions), and standing room areas. NO outside chairs allowed. Accessible seating is also available. Limited VIP seating in prime viewing area (along the start straightaway and into turn 1), and dedicated line at the bar. The doors to the event are on the inner portion of the building, near the famous rotunda. BAD events at the Palace of the Fine Arts Venue are ADA accessible. #20ShineTeen is finally here for Bay Area Derby! 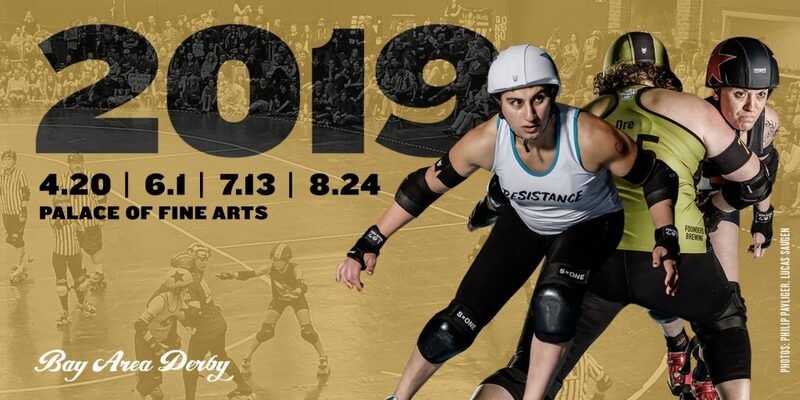 Our three home teams–Oakland Outlaws, San Francisco ShEvil Dead and Berkeley Resistance–are ready to throw down to see who will reign supreme over the Bay this year. Purchase your VIP and Season Tickets early to secure the best trackside seating, bar access and value for your dollar! You can also take the PresidiGo for free on weekends from Embarcadero BART to Letterman Digital Arts Center, only a half mile from the venue! Check out our Ridevu page to connect with other fans and request rides, as well as share a taxi to the event! Round 2 of #20ShineTeen‘s BAD Roller Derby Tryouts are here! Tryouts will be held at BAD HQ in West Oakland. Address will be provided upon registration. Please arrive between 12:30 PM and 1:00 PM for check in! Skates and protective gear (aside from mouth guard) are possible to borrow at our practice venue. We cannot guarantee your size. We highly recommend purchasing your own protective gear for cleanliness and safety. You MUST provide your own mouth guard. We’ll see you on the track! Hey Palentine! Come join us for the first of Bay Area Derby’s #20ShineTeen season’s themed B&W scrimmages! Deck yourself out in white or red shirts, craft some valentines, and compete with your pals to be the winning team! This event will feature three leveled scrimmages (the first two for beginner and intermediate skaters will last 30 minutes and the final scrimmage for advanced skaters will last 45 minutes)! Beginner: You have passed WFTDA minimum skills, may have skated in some scrimmages and/or games, still have a lot to learn on and off the track but are excited for new challenges. Intermediate: You have passed WFTDA minimum skills, can confidently skate and scrimmage, may be on your league’s B-team but are looking to progress to the next level. Advanced: You have passed WFTDA minimum skills, can skate confidently forwards and backwards and are on your league’s A-team. Please note that all skaters will be asked to sign a waiver upon arrival. Both a red and a white t-shirt with your WFTDA-approved number on the back. All gear including mouthguard. All skaters will be gear checked before they skate. 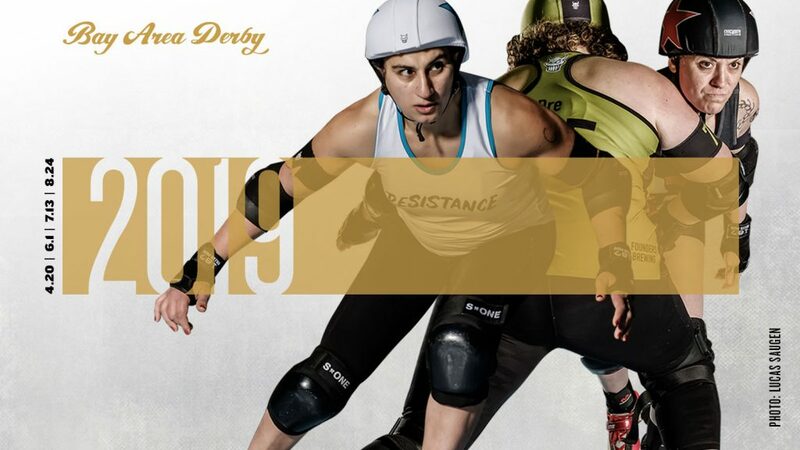 Bay Area Derby Officials are pleased to announce BAD to Good to Great II, a *WFTDA Clinic-In-A-Box* targeted at “intermediate” officials who are looking to get a head start on their 2019 season and plans! 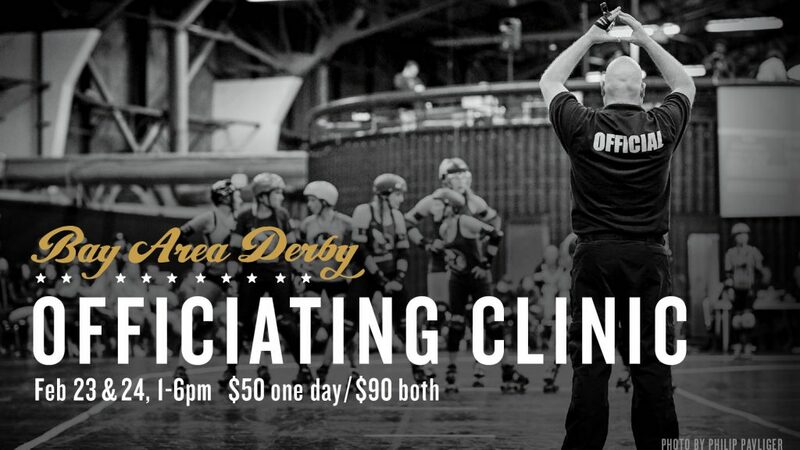 We are pleased to host Nine Inch Wheels and Don Scoreleone as our WFTDA Officating Instructors who will be leading the clinic, to provide a fresh perspective for those who attended our prior clinic as well. Additional seminars will be given by TaraByte, the chair of WFTDA’s Tournament Officials Selection Panel (TOSP) and Danger Muffin, a member of Officials Certification Oversight. Based on feedback from our prior clinic, BAD to Good to Great II will take place from 1pm-6pm on Saturday and Sunday. Officials may attend one day for $50 or both days for $90. A more complete schedule for the two days will be released in the next few weeks, as will links to purchase tickets. RSVP “Interested” or “Going” to get notifications from this event! Bay Area Derby presents Reckless Skate Camp, a progressive skating clinic aimed at getting beginner skaters ready for entry-level roller derby starting January 16, 2019 and running through March 2, 2019. On Wednesday nights we will teach a structured agenda starting from the very beginner level skills and building up to the minimum skills required to join a roller derby league as a new skater. On Friday nights we will host an open skate session with trainers and coaches available to answer questions and give feedback. On Saturday afternoons, Camp attendees will be invited to come to Pool Practices to practice with other new members of Bay Area Derby. The Bay Area Derby Reckless Skate Camp is geared towards beginner skaters who want to skate in a flat track roller derby environment. We’ll break down the basics of proper derby stance, work on building muscles to maintain that stance, stopping techniques, fluid movement on the track, laterals, jumping and weaving. The latter part of the classes will focus on partner and pack work as well as game aspects, including blocking and hitting. Wednesday Camp Sessions are 6:30pm-8pm and will provide a structured learning experience delivered by one of Bay Area Derby’s coaches. Friday Open Skate Sessions are 6:30pm-8pm and will provide an opportunity to come and practice the skills you are learning in Wednesday Camp sessions. Trainers will be present on Fridays for questions and feedback. Saturday Pool Practice Sessions are 1pm-3pm and will provide an opportunity for Camp attendees to come and practice with the other newest members of Bay Area Derby with the Pool skaters and coaches. Attendance at every session is not required but highly encouraged, as each class builds upon the previous one. No refunds will be given, including for missed sessions or drop-outs. We are limiting the clinic to 35 skaters in order to provide each participant quality instruction and individual feedback. Please arrive 15 minutes before sessions to gear up and warm up. Bring sneakers. Skate Clinic Pass holders may also attend unlimited Dudes (all gender) practices in January and February. Skates and protective gear (aside from mouthguard) are possible to borrow at our practice venue each session on a first-come, first-served basis. We cannot guarantee your size or quality of equipment. We highly recommend purchasing your own protective gear for cleanliness and safety. You MUST provide your own mouthguard. Quad Republic Skate Co. (https://www.quadrepublicskateco.com/) is a skate shop located onsite and is able to help with any equipment needs. They are offering a 10% discount to BAD Beginnings participants. (11am registration and warm up). BAD Park is starting our guest coach series with Estro Jen! Estro Jen, Dita de los Muertos, Kid Ace will be stopping by the BADPark with a full sizing range for Jack boots to help you choose the perfect pair. 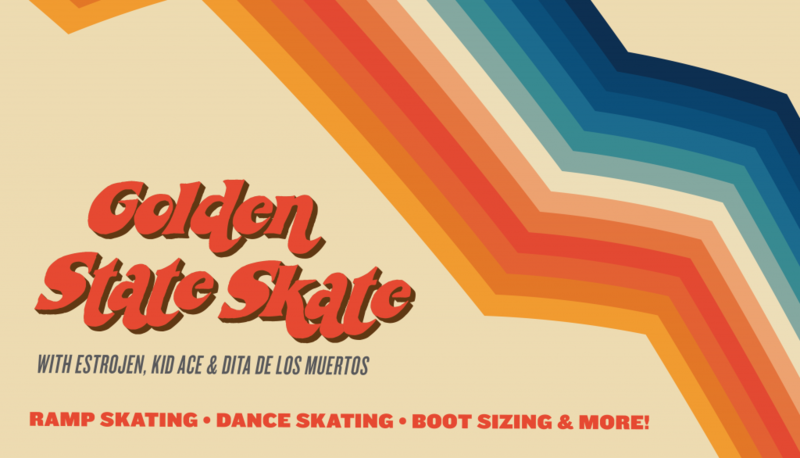 In addition, they will be lending their skate knowledge to help you add more tricks and dance to your toolbox. 2 days, 6 hours of skating – Learn Ramp and Skate Dance from the best. November 24th-25th from 12:00 – 5:00 pm (11 am registration and warm up). $35 for one day, $60 for the weekend, limited tickets. Mark you calendars and sign up here. Our tryouts for the 2019 season are December 8th! Tryouts will be held at BAD HQ in West Oakland. Address will be provided upon registration. Skates and protective gear (aside from mouthguard) are possible to borrow at our practice venue. We cannot guarantee your size. We highly recommend purchasing your own protective gear for cleanliness and safety. You MUST provide your own mouthguard. Want to warm up your wheels before tryouts? This is a mixed-level scrimmage, but in order to participate you must be an active member of a roller derby league, 18 years or older, and cleared for contact/scrimmage. If you’re a new skater interested in roller derby we encourage you to check out our Reckless Rollers program or Beginner Skater Clinic. Bay Area Derby skaters will be your bench coaches for the afternoon—so no need to worry about helmet covers or support staff. Dressing in theme is encouraged (but not required). There will be awards for the best costume on each team! Registration ends October 7 and/or we have reached the maximum number of 15 skaters per team. Then you will be sorted onto 1 of the teams by BAD staff. We will email you by October 8 to let you know what team you’re on so you can get your shirts and costumes ready! *October 20th is session is off-skates rules class & scrimmage viewing to learn the game of derby. 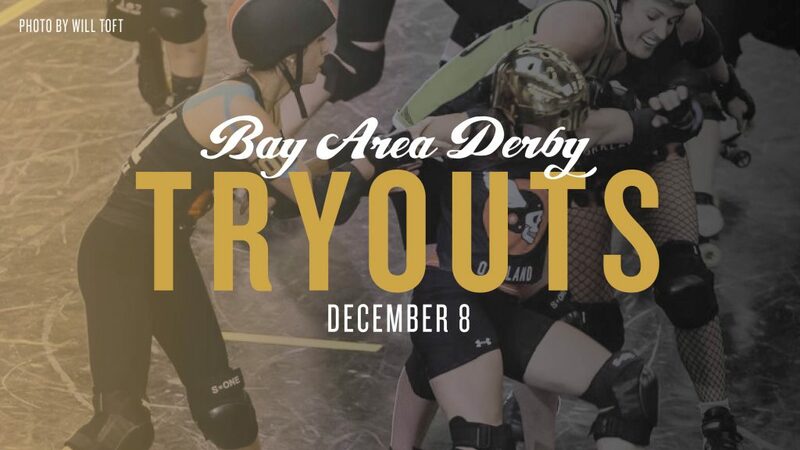 Bay Area Derby presents a 12 session clinic aimed at getting beginner skaters ready for entry-level roller derby starting October 6 and running through November 17. We will teach you the minimum skills required to participate in our roller derby tryouts on December 1st and 2nd. The BAD Beginner Skate Clinic is geared towards beginner skaters who want to skate in a flat track roller derby environment. We’ll break down the basics of proper derby stance, work on building muscles to maintain that stance, stopping techniques, fluid movement on the track, lateral movement, jumping, and weaving. The latter part of the classes will focus on partner and pack work as well as game aspects, including blocking and hitting. Saturday sessions are 1pm – 3pm. Monday sessions are 6:30 – 8pm. 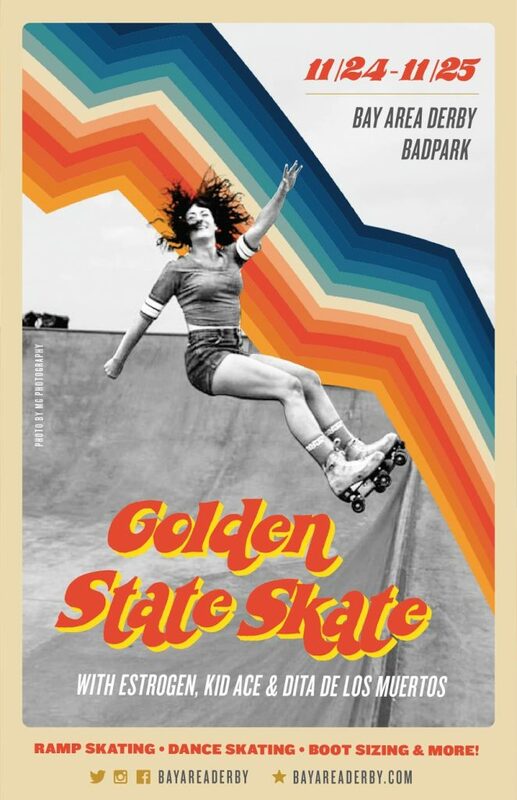 All Bay Area Derby Beginner Skate Clinic sessions will be held at BAD HQ in West Oakland. Address will be provided upon registration. TRYOUTS for the 2019 season are December 1st and 2nd, 1-4pm Saturday and Sunday. Reserve your spot at tryouts when you register for the clinic and save! Attendance at every session is not required but highly encouraged as each class builds upon the previous one. No refunds will be given for missed sessions or drop-outs. We are limiting the clinic to 35 skaters in order to provide each participant with quality instruction and individual feedback. Please arrive 15 minutes before sessions to warm up and gear up. Skate Clinic Pass holders may also attend unlimited Reckless Rollers sessions in October and November. Skates and protective gear (aside from mouthguard) are possible to borrow at our practice venue each session on a first-come, first-served basis. We cannot guarantee your size. We highly recommend purchasing your own protective gear for cleanliness and safety. You MUST provide your own mouthguard.